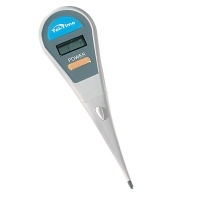 Clinical and ear thermometers for home use. Read Outdoor Temperature Easily - No Installation! DigiScan Multi-Function Talking Thermometer - This talking thermometer offers a quick and accurate reading, and reduces the eye strain of having to read the temperature. With this low vision product, you no longer have to squint and strain your eyes. Kids often hate the process so they fight it, resulting in inaccurate readings because the thermometer didn't stay in their mouth long enough, not to mention frayed nerves and unnecessary stress for both the parent and the child. With this talking thermometer, you can quickly take your child's temperature and hear the results spoken to you. Now you can leave the battles and tears of the temperature wars behind you! Help is now here in the form of the DigiScan Multi-Function Talking Thermometer. 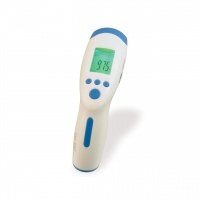 This handy, practical talking clinical thermometer uses infrared technology that instantly reads body temperature to give you accurate readings by simply pressing it into the ear or against the forehead. Audio readings available in multiple languages - English, Spanish, French, German, Italian and Russian. Sanitary help prevent the spread of germs. For oral or underarm method. Fits most Thermometers. 100 per package. HealthSmart Kids Margo Moo Thermometer is a fun and kid-friendly solution to taking temperatures for children. 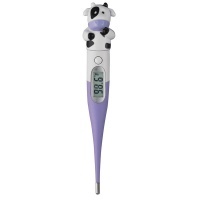 The animal thermometer has a large, easy-to-read display and reads out the temperature in a quick 30 seconds. 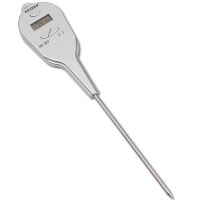 This thermometer also has the ability to read in either Fahrenheit or Celsius degrees with an easy switch button. Not sure if you need that extra sweater or cap? Never second-guess outdoor temperature again Simply peel the static cling from the package and adhere to any clean outdoor window. That's all you need to set up this EASY-TO READ thermometer It adheres electrostatically, so you're free to remove the thermometer any time you need to, whether it's for window cleaning or you've changed your preference about where you'd like to hang it. 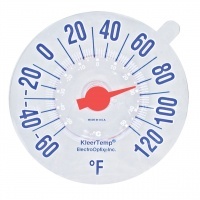 This thermometer is so versatile, it could go from home to motorhome to boat Size: 7 1/4 diameter. Fits all standard windows. This Spanish-speaking Talking Non Contact Infrared Digital Thermometer uses advanced infrared technology to take your temperature in just 1 second! 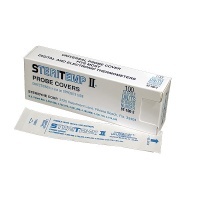 This multi-purpose no-touch thermometer offers 3 modes allowing you to quickly and accurately measure body temperature, surface temperature and room temperature. You can conveniently switch between Fahrenheit and Celsius readings. Simply hold the infrared sensor 3 to 5 centimeters away from the surface of the skin and press the scan button. The temperature will then be announced in a loud, clear, female voice and the reading will be stored in memory (up to 32 readings can be stored). There is also a fever alarm that will alert you if the temperature registers over 100.4 degrees Fahrenheit / 38 degrees Celsius. This is the perfect Spanish-speaking talking thermometer for the blind or visually impaired, and is also an ideal hygienic solution for the whole family since there is no contact involved. You can turn off the talking function to monitor someone's temperature during the night while they are sleeping, making this a great thermometer for caregivers as well. Uses 2 AA batteries (not included). Soft carry bag is included. 1-year warranty.